Liz had just finished high school and was taking a year off before she started college. But her plans were derailed when she was unexpectedly diagnosed with leukemia. After that, going to college was off the table…and so was being a carefree teenager. Her life became all about enduring chemotherapy, getting a stem cell transplant, and spending many, many nights in the hospital. Liz says a lot of her friends deserted her, but thankfully, her true friends stayed close. That’s where Team Summer kid Ansley stepped in! Ansley is the cancer warrior of all cancer warriors. Now 20, she has been battling neuroblastoma – a cancer of the nerve tissues – since she was two years old. 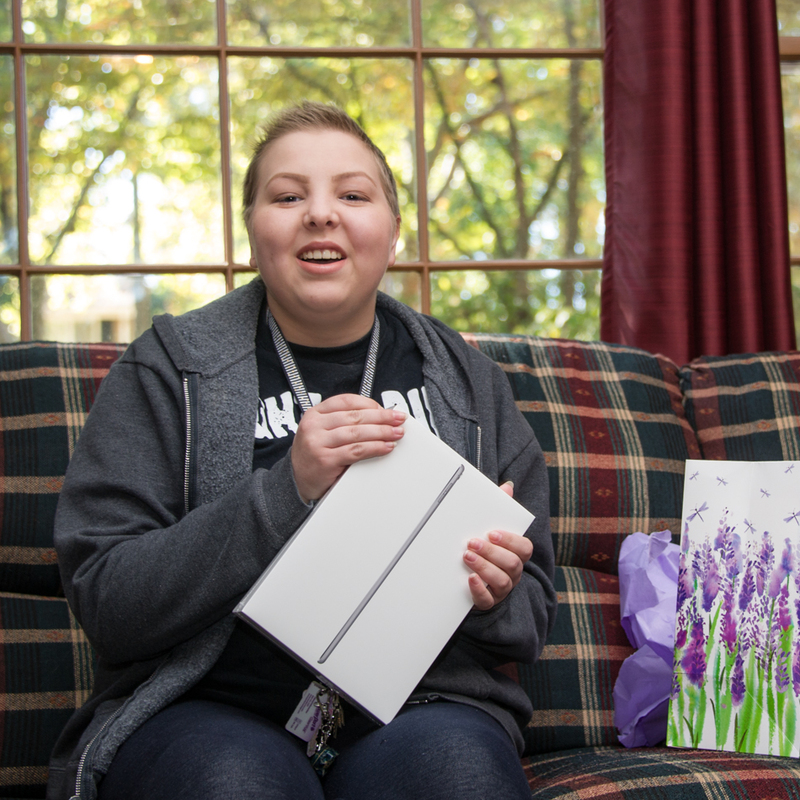 She surprised Liz with a gift to help her get her college dreams back on track. An iPad Pro! Liz plans to use it to start on-line college classes. How cool is that? She says she wants to become an oncology nurse because she now knows how important they are. She says without them she doesn’t know how she would have made it through her first few months of treatment. Ansley and Liz chatted about the kind of things young girls normally talk about – hair styles, fashion boots and the like. But underlying it all was a natural camaraderie. Two girls who share the same struggles. Two girls who know it’s easier to share the burden than carry it alone. All our gifts are funded by donors like you! Can you help us make a kid battling cancer smile?